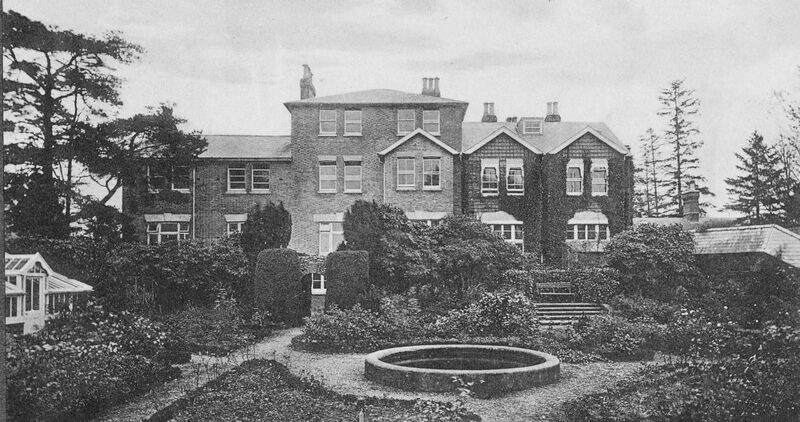 The building now known as Copthorne Preparatory School was originally built as a private dwelling called Emsworth House, and was owned by the Kensington Family. Mr Edward Kensington was a wealthy advertising agent who retired to Copthorne in 1888. He died in 1895 at the age of just 55 years following a period of ill health. Newspapers of the time report that ‘Copthorne and neighbourhood has lost a valued resident and the poor inhabitants especially a kind and generous benefactor’. 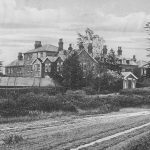 In 1897, Emsworth House became a temporary home for Twyford School whilst their own buildings were reconstructed, and was then founded by Mr Bernard H. Rendall in September 1902 as a boys’ school. He was the brother of the then Headmaster of Winchester College, and the school was originally designed as a feeder school for Winchester. 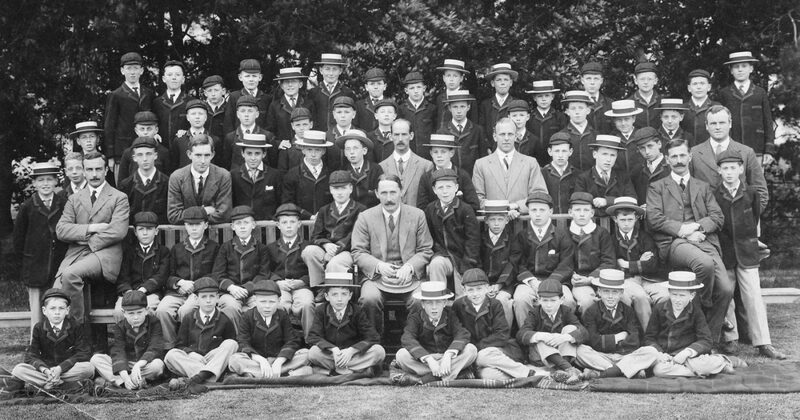 Copthorne Preparatory School began with just 9 boys. 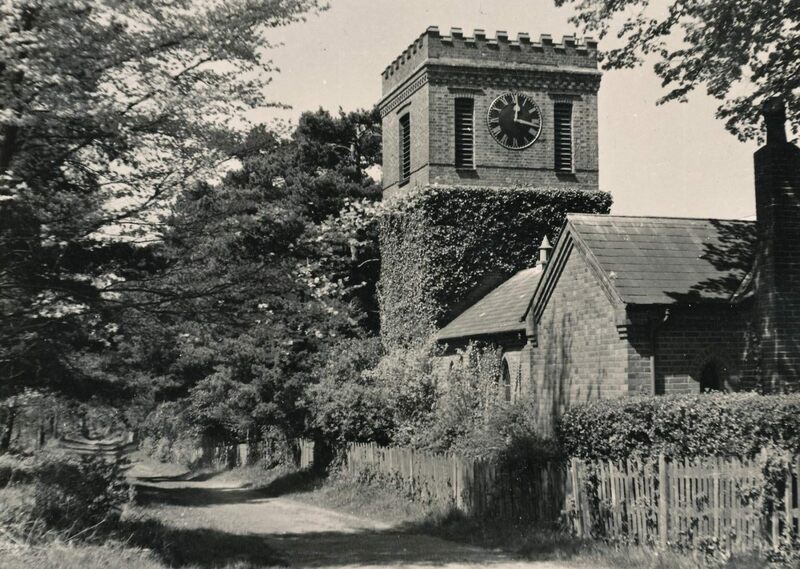 Part of the original building that was initially used as an observatory, complete with tower, was converted into a Chapel for the school and was dedicated by the Bishop of Lewes on October 20th 1910. The first edition of the Copthorne School Chronicle was published in November 1911 with the object of ‘bringing old boys together who have lost sight of one another and to inspire present members of the school with a pride in their forerunners and determination that they will keep up the standard of work and play which others have handed down to them’. Subscriptions were initially 1/6 per annum. In 1913 the sad news of the tragedy in the Antarctic touched many at the school as Dr Edward Wilson, who was Mr Bernard Rendall’s brother-in-law, had made the school his headquarters for a short time after the ‘Discovery’ Expedition. 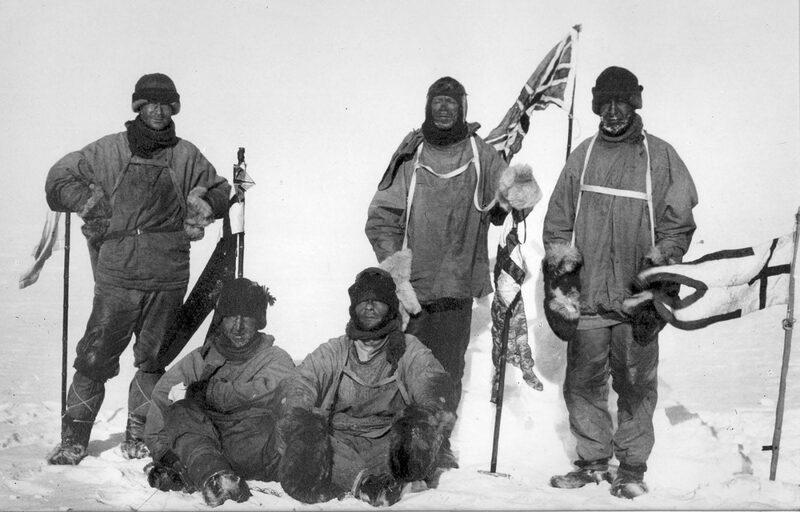 He visited again before starting out on the second expedition to tell the school of their aims and to thank the school for their generous contributions to the funds for the expedition from which a sledge named ‘PIP – Primus Inter Pares’ [First among equals] was provided as well as scientific instruments. Captain Scott also wrote to the school in the days before their departure thanking everyone for their financial assistance. The Copthorne School Chronicle of the time notes that ‘In the manner and circumstances of their death they have left an undying heritage, ….an example of endurance, self-sacrifice and heroism.’ A fund was established at the school to honour Dr Edward Wilson’s memory and the stained glass window in the Chapel remains a fitting tribute to the man. At the South Pole. Wilson (left), Scott and Oates (standing), Bowers and Evans (sitting). In spite of the worsening situation in Europe, the normality of day to day school life continued, the number of boys at the school continued to rise, buildings were improved and extended and even a large plunge bath was installed. However, by 1914 thoughts at the school were very much on the battlefields of France and Poland. News of the death of an Old Boy, 2nd Lieutenant E. H. Tottie, from wounds received at the Battle of the Aisne just four days after joining his regiment at the front came as a sad reminder to all of the severity of the situation. By March 1915, war continued to be the focus of attention and the sad loss of two more Old Boys had hung heavily during the previous Christmas term. It was during this time that the boys took to knitting scarves which were sent to the soldiers at the front. By now, many Old Boys and Staff were fighting or training to fight in Flanders and the school sent their best wishes to all for a safe return home by the end of the year. This was not to be the case and whilst the school continued its daily routine, by now the school roll was 67 boys, the sound of the guns at the Front, which were heard frequently and distinctly at the school, reminded everyone of the many Old Boys and Masters who were risking their lives. Owing to the war the school recognised that ‘we have to eat less meat and less bread’ and concerts, productions and other celebrations were cancelled. Plans for a fitting memorial to the fallen were already underway by March 1918 and the decision was made to raise the chapel tower and to install a clock and chimes ‘to look out over the school for the generations to come’. The cost of £350 was quickly raised and the clock was erected in the summer of 1919. 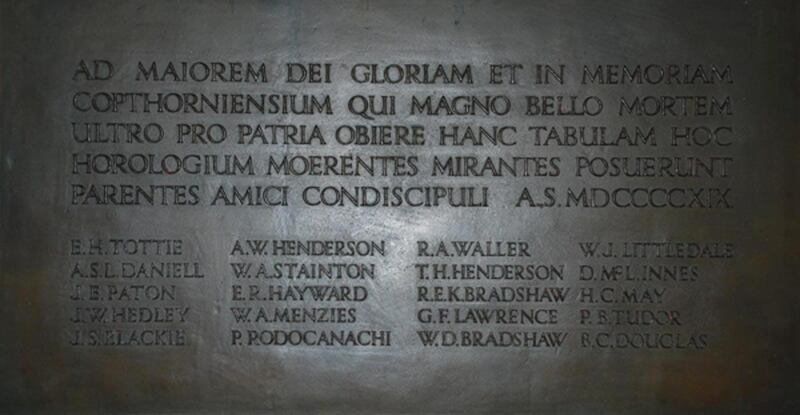 A bronze plate listing the twenty Old Boys and Masters the school lost in the War was positioned on the South Side of the Chapel. In December 1919 rugby football was taken up as an experiment. Whilst not an immediate success, most of the boys mastered the rudiments of the game during the term although by the end, the general verdict was a preference for the game of football. As well as football, the boys also played hockey and cricket against other Preparatory Schools in the area. The rifle range was installed in 1920 and it is reported that, ‘it is in our opinion most desirable that every boy should learn to handle and shoot with a rifle’. The boys were issued with Messrs Charles Letts’ diaries as an experiment. Six piano practice rooms and a music lesson room were constructed in 1924 and it is also in this year that regular boxing instruction resumed. C P Brutton represented and eventually Captained Hampshire County Cricket Club in the 1920’s and also played for the MCC. Following Mr Bernard Rendall’s retirement in December 1928, Mr Ernest Skeete Workman took over the running of the school in partnership with Mr John Philip Howard. H D Read took his 100th first class wicket in 1935 playing for Essex and went on to play for England later that year. E D E Reed was awarded his Rugger Blue for Cambridge on November 23rd 1935. On the 10th July 1937, the school mourned the loss of its founder Bernard H. Rendall at the age of 71. He was buried at his birth place of Great Rollright, Chipping Norton, Oxfordshire. Following a successful appeal for funds, the Rendall Memorial Library was opened in 1939. During World War II, the school was evacuated to the Lee Bay Hotel in Ilfracombe. The school building was requisitioned for use by the Army, the Royal East Kent Regiment were initially stationed at the school and then the Royal Air Force. Little occurred to vary the day-to-day routine for the boys in the almost peace-time atmosphere of Lee Bay although they were evacuated from the hotel for 24 hours in November 1940 when a floating mine was spotted in the bay. In 1943 the School buildings were used as a hospital under the authority of the Canadian French forces. 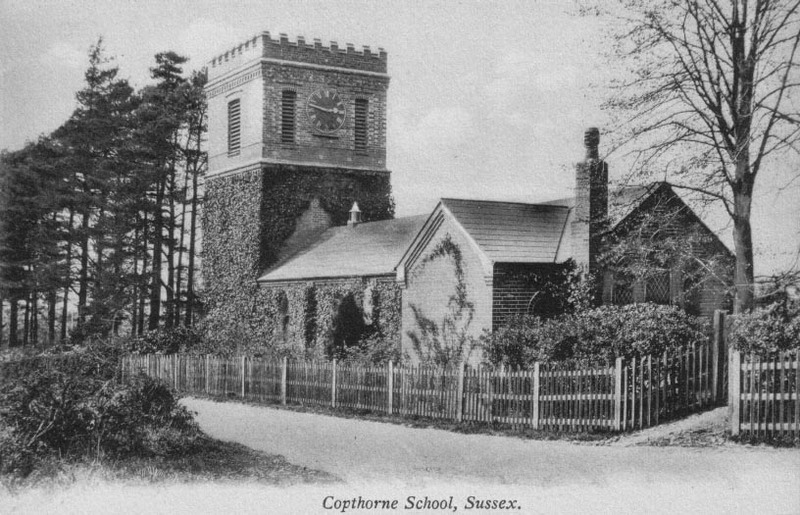 The school returned to Copthorne from Lee Bay in March 1945 although it was not until 1946, that the canteen was removed from the asphalt and 1947 that the last of the foundations from the Nissan Huts were removed and few traces of the war occupation remained. Fuel remained in short supply but anthracite stoves in the schoolroom and dining room proved very beneficial. 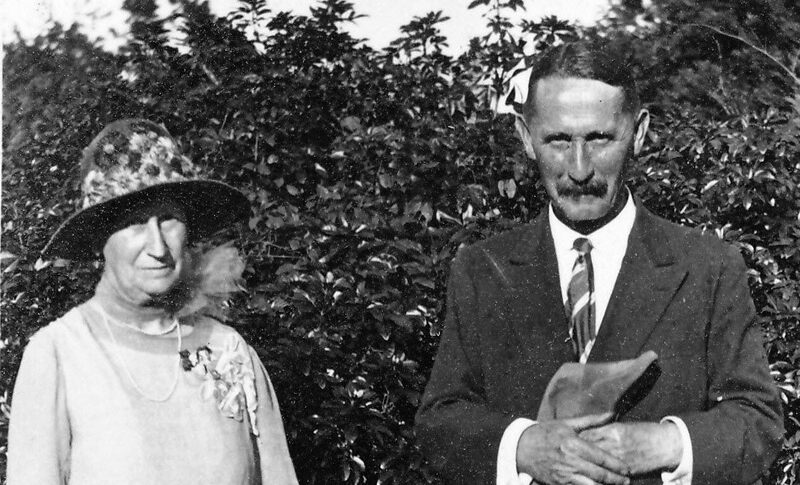 In November of 1946 the school mourned the loss of Mrs Lilian Mary Rendall, wife of Mr Bernard Rendall the founder of the school, who died in her 80th year. Illness was again rife in the Spring Term of 1947 when, after a short spell of mild flu, measles started, claiming all but one boy as its victims, with the majority succumbing at the same time: chicken pox then started before the measles had ended. The resumption of the regular call of the ‘Harrods Van’, complete with its pre-war driver and assistant, brought some cheer at this difficult time. The summer saw hay on the football field cut by tractor for the first time following the retirement of Mr Booker’s faithful pair of horses. And the sound of the hurdy-gurdy could once again be heard from the school when the annual visit of the travelling fair to Copthorne Common resumed. School concerts and the Christmas Party were reinstated in 1947 after an absence of 9 years. The common was once again in the news when a fire raged across it in the Easter holiday of 1948. Flames came to the edge of the drive by the front door and burning embers became lodged in the windows and on the roofs facing the common. Fortunately the school buildings were spared and the common although badly scorched, soon recovered. Mr Howard retired in 1949 and was replaced for a short time by Mr Pinney an Old Boy of the school. The 1949 Boat Race included J R La T. Corrie (Copthorne 1936-39) rowing No.4 in the successful Cambridge Boat. On the sudden death of his father in 1952 and the departure of Mr Pinney, Mr P. J. H. Workman (Tim) took over as Headmaster at the age of just 25; he was at the time the youngest Headmaster in the IAPS. The Jubilee celebrations were somewhat subdued as it was Ernest Skeete Workman who had planned the ‘celebration to mark BR’s initial effort and that of the school these 50 years’. The Ernest Skeete Memorial fund set out to raise the sum of £2000 in order to refurbish the Chapel Organ in his honour. A rival to the ‘Copthorne Chronicle’ appeared in 1956 when members of the 1st Form wrote and published ‘The Copthornian’. There was a sad farewell in 1960, not to the coke boilers which were replaced by oil heating, but to Miss Thompson, known to all as ‘Nanny’ who retired after 36 years faithful service to the school. A popular innovation in 1961 was Sports Day which was held at the end of the Easter Term although mumps interfered as a number of competitors were either in bed or on their way home. In 1963 the school mourned the loss of Mrs Skeete Workman who died in the Easter Term and was buried at Copthorne Parish Church. Mr David Sale who had joined the teaching staff at the school in 1954 become joint Headmaster with Mr P J H Workman in 1963. The Jubilee Cup Competition was revived in 1963 with boys competing for one of four houses, Red, Blue, Green and Silver, over a range of events from Boxing to Ping Pong. The magnificent trophy, first presented in the school’s Jubilee year, is still competed for today although the four houses now proudly bear the names of previous Headmasters – Rendall, Workman, Sale and Newton. In 1964, numbers at the school exceeded 100 for the first time in its history and in 1965, the school showed it was keeping pace with technology with the installation of a giant television set. A filtration plant for the swimming pool was also installed bringing with it a permanent supply of clear water, although there is no mention of any heating. Illness continued to interfere with sport fixtures as the school was yet again quarantined in the Easter Term of 1966 following a Scarlet Fever epidemic. The first science laboratory was opened in 1967. Initially Physics and Chemistry was taught to the top form although this was soon extended, with the top three forms taking the Nuffield Science Course. Following the traditional ‘Patres’ cricket match a riding display was performed by the boys which it was hoped would become a yearly tradition. The school took part in the Six-a-Side Soccer Tournament at Manor House on the last day of the Autumn Term in 1969. Following the closure of Manor House in 1970, Copthorne have hosted the tournament ever since. Also in 1970, a new venture was a chess match at Fonthill during the Easter Term. Copthorne lost 7-3. The school celebrated its 70th Anniversary in 1972 with an Old Boys Reunion to which over 70 Old Boys attended. Shooting was briefly halted when, following an inspection of the range, it was deemed to be unsafe although it was back in action by 1973. The Junior Department or as it is now known, the PrePrep, began operating in the Autumn Term 1973 and was officially opened in January 1974. Other notable improvements at that time were the completion of two hard tennis courts and the addition to the clothing list of tracksuits and wellington boots to allow for more time to be spent outdoors. 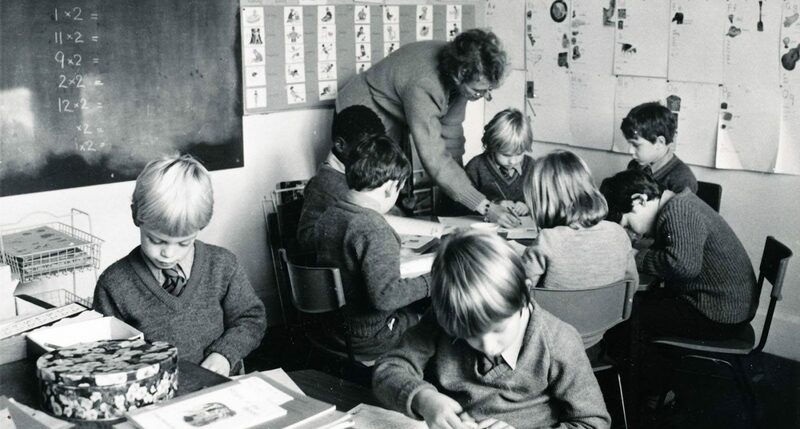 On the 1st January 1976 the school was formed into a charitable trust run by a governing body. Following a period of ill health, Mr P J H Workman retired at the end of the Easter Term 1976 and thereafter, Mr David Sale was joint Headmaster with Mr David Cann (1976-1982) and then with Mr David Newton. The ‘Friends of Copthorne’ was established at this time and the school held its first cycling proficiency course in the Summer Term of 1976. In the Autumn Term of 1979, girls were admitted for the first time. On Mr David Sale’s death in 1984, Mr David Newton was the sole Headmaster until his retirement in 1999. He presided over the building of the Sports Hall, a project he first began with Mr David Sale when they instigated an appeal to raise the £80,000 required to complete the venture. Ground works for the building got underway at the end of 1984 with the help of the then Head Boy Harry Meyer, 12, and David Litchfield, aged 4. On the completion of the Sports Hall’s, the old gymnasium was converted into the Theatre, so ending productions in the ‘big school room’. By 1988, communal dining was replaced by self-service and the ancient oil burning agas were replaced by modern kitchen equipment. The last of the iron framed beds were replaced during a period of modernisation of the boarding accommodation in 1995 and the open rows of cast iron baths were replaced by modern shower cubicles. 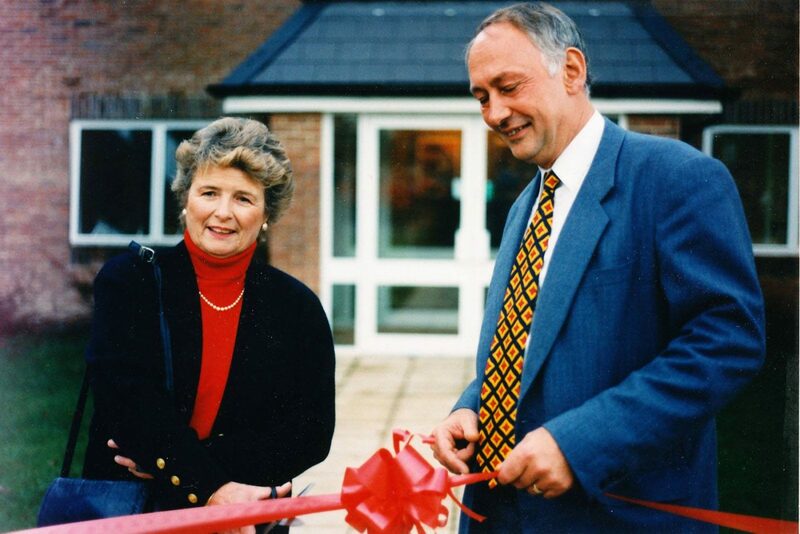 The school continued to thrive during 1990’s, an extension to the Junior Department was completed and opened by local MP, Mr Peter Ainsworth in 1996 and in 1997 the Coach House Nursery became a welcome addition to the school. Space in the Prep School was also at a premium and the opening of the new classroom block by Lady Shattock, formally Mrs Sale, in November 1997 allowed for the much needed expansion. Following Mr David Newton’s retirement, the Governor’s appointed Mr Charles Allen a Housemaster from Sherbourne School to the role of Headmaster at Copthorne. There followed a six year tenure during which time he maintained and developed the strong academic standard so expected of Copthorne pupils by the Senior Schools. Sporting success also continued and the girls won the National IAPS Netball Tournament in 2000 a first for Copthorne. In 2002 the school celebrated its Centenary with a Ball at the Effingham Park Hotel and a series of events at the school. The Old Boys were well represented at these celebrations and the talk soon turned to wicked deeds, to ‘Copthorne Soup’, to sporting success and to “Rise Boys shine, bath morning”. The present Headmaster, Mr Chris Jones, started at the school in September 2005. Under his leadership, the school has continued to expand and he has overseen improvements and additions to the buildings in the Nursery, PrePrep and Prep School. The school is now predominantly a day school, although some children take advantage of the weekly and flexi-boarding opportunities that are still available. The school prides itself on the 10 year journey that it now offers from the first tentative steps into the Nursery to the confident pupils, who have made full use of the opportunities afforded to them and achieved their potential in so many ways by the time they leave us. In the tradition of the school, scholarship success continues, not these days to Winchester, but more often to one of the numerous Public Schools that exist in close proximity to Copthorne. Into the future the school goes on building, on firm foundation of tradition, well established. Floreat! Robert Graves, Poet, novelist, author of ‘I, Claudius’ and ‘Goodbye to all that’. Charles Graves, His brother, also an author. Derek Alan Trevithick Tangye, Author of ‘The Minack Chronicles’. Charles Phipps Brutton, Hampshire cricketer. Holcombe Douglas ‘Hopper’ Read, Essex and England cricketer.